Dubai, UAE, March 20, 2018: To celebrate 100th anniversary celebrations, Mido has launched the Commander Big Date: a series of innovative models presenting a large date aperture at 6 o’clock. 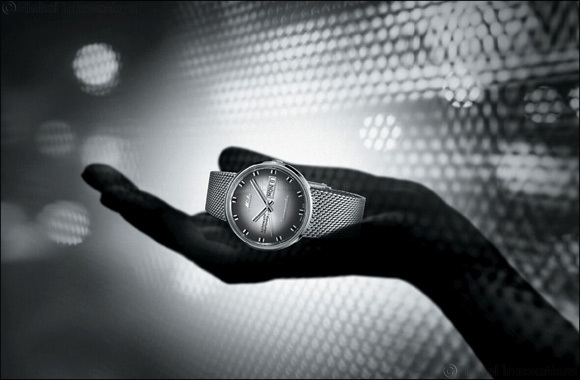 For these models, Mido has developed an exclusive movement with a large date aperture based on its Caliber 80. Offering unrivalled date legibility, this new line adopts the codes that have given the Commander its legendary status: a sunray satin-finished dial that is extremely pure, protected by an elegant round case in satin-finished stainless steel and enhanced by a polished bezel. Beyond its aesthetic assets, the Commander Big Date celebrates a large date while housing an exclusive automatic movement. In addition to its original date display, the Caliber 80 with large date aperture offers formidable autonomy: up to 80 hours of power reserve. The collection ranges from AED 3,600 - AED 4,100 and is available at Rivoli stores across the UAE.